I am currently practicing the Copland Piano Sonata in preparation for a performance later this season, so I was interested to see a volume of Copland essays by various authors from about 10 years ago on the shelf at Penn’s library. 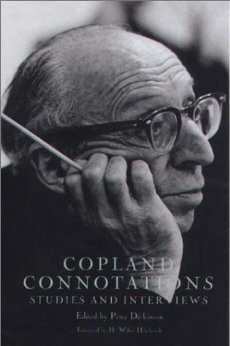 Copland Connotations is edited by Peter Dickinson, a British composer, pianist, scholar, and champion of American music in general and Copland in particular. As with most such collections, the essays are a mixed bag. In his piece on “Copland and the ‘Jazz Boys'” David Schiff is quite frank about the composer’s condescension toward and even ignorance about jazz. Though a couple of early pieces by Copland are supposedly jazz inspired, Copland’s idea of jazz seems derived from the novelty piano pieces of Zez Confrey (“Kitten on the Keys”) as much or more than Armstrong or Ellington. Other worthwhile essays exploring points of contact between Copland and popular musics include a piece by William Brooks on the many lives of “Simple Gifts”, and Stephen Banfield on “Copland and the Broadway Sound”. Essays by Mark DeVoto on Copland and his fellow students of Boulanger, and Vivian Perlis on Copland and pianist John Kirkpatrick are more anecdotal, but still intriguing. Arnold Whittall’s piece on the Piano Fantasy comes the closest of anything in the book to being a serious analysis of a Copland piece, but is more descriptive than analytical. Remarkable to say, you can see the sketches for the Copland Sonata online here.